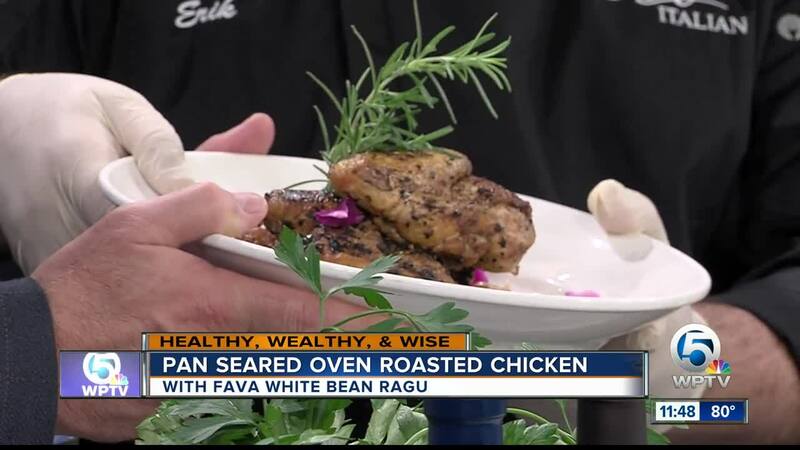 Chef Erik Pettersen of Evo Italian restaurant cooks up a tasty Italian-inspired roasted chicken. Recipe courtesy of Chef Erik Pettersen of Evo Italian in Tequesta. Preheat oven to 350 degrees. Take the half chicken skin side up, dry rub with pink sea salt and fresh herbs. Now, take a medium sized sauté pan, add a 1/4 cup of olive oil, and bring to medium high heat. Take the chicken(seasoned) skin side down into the olive oil and cook at medium high heat for 5-6 minutes until skin is turning golden brown. Then flip the chicken and put it into the preheated oven. Then cook for another 15-20 minutes in the oven until the chicken is at a minimum of 160 degrees. Now, in a separate sauté pan add the other 1/4 cup of olive oil, add garlic, shallots and cook until the color is golden. Add Fava and white cannellini beans, cook for 3-4 minutes until steam rises. Add a tablespoon of pink sea salt for flavor. Plate the bean mixture on center of the plate, take the chicken from the oven and place it over the top of the Ragu. Now, squeeze fresh lemon over both items and add a sprig-of rosemary for a nice presentation, and voilà there is your healthy wealthy and wise oven roasted chicken over a Fava and white bean ragu that is sure to impress your friends or loved ones!! !